1 A None No Power Seat 1 A is a standard Club Business Class Bulkhead seat. The tray table is in the armrest, making the armrest immovable and slightly reducing seat width. There is no floor storage for this seat during take-off or landing. 1 C None No Power Seat 1 C is a standard Club Business Class Bulkhead seat. The tray table is in the armrest, making the armrest immovable and slightly reducing seat width. There is no floor storage for this seat during take-off or landing. 1 D None No Power Seat 1 D is a standard Club Business Class Bulkhead seat. The tray table is in the armrest, making the armrest immovable and slightly reducing seat width. There is no floor storage for this seat during take-off or landing. 1 G None No Power Seat 1 G is a standard Club Business Class Bulkhead seat. The tray table is in the armrest, making the armrest immovable and slightly reducing seat width. There is no floor storage for this seat during take-off or landing. 1 H None No Power Seat 1 H is a standard Club Business Class Bulkhead seat. The tray table is in the armrest, making the armrest immovable and slightly reducing seat width. There is no floor storage for this seat during take-off or landing. 1 K None No Power Seat 1 K is a standard Club Business Class Bulkhead seat. The tray table is in the armrest, making the armrest immovable and slightly reducing seat width. There is no floor storage for this seat during take-off or landing. 10 D None No Power Seat 10 D is an Economy Class seat that does not recline due to the Exit Row behind. The close proximity to the lavatories may be bothersome. 10 F None No Power Seat 10 F is an Economy Class seat that does not recline due to the Exit Row behind. The close proximity to the lavatories may be bothersome. 10 G None No Power Seat 10 G is an Economy Class seat that does not recline due to the Exit Row behind. The close proximity to the lavatories may be bothersome. 14 A None No Power Seat 14 A is a standard Economy Class seat that has extra legroom. However, the close proximity to the lavatories may be bothersome. Also, the protrusion from the Exit slide may restrict leg space. The tray table is in the armrest, making the armrest immovable and slightly reducing seat width. There is no floor storage for this seat during take-off and landing. 14 B None No Power Seat 14 B is an Economy Class Exit Row seat that has extra legroom. However, the close proximity to the lavatories may be bothersome as passengers tend to congregate here. The tray table is in the armrest, making the armrest immovable and slightly reducing seat width. There is no floor storage for this seat during take-off and landing. 14 C None No Power Seat 14 C is an Economy Class Exit Row seat that has extra legroom. However, the close proximity to the lavatories may be bothersome as passengers tend to congregate here. The tray table is in the armrest, making the armrest immovable and slightly reducing seat width. There is no floor storage for this seat during take-off and landing. 14 D None No Power Seat 14 D is an Economy Class Exit Row seat that has extra legroom. However, the close proximity to the lavatories may be bothersome as passengers tend to congregate here. The tray table is in the armrest, making the armrest immovable and slightly reducing seat width. There is no floor storage for this seat during take-off and landing. 14 F None No Power Seat 14 F is an Economy Class Exit Row seat that has extra legroom. However, the close proximity to the lavatories may be bothersome as passengers tend to congregate here. The tray table is in the armrest, making the armrest immovable and slightly reducing seat width. There is no floor storage for this seat during take-off and landing. 14 G None No Power Seat 14 G is an Economy Class Exit Row seat that has extra legroom. However, the close proximity to the lavatories may be bothersome as passengers tend to congregate here. The tray table is in the armrest, making the armrest immovable and slightly reducing seat width. There is no floor storage for this seat during take-off and landing. 14 H None No Power Seat 14 H is an Economy Class Exit Row seat that has extra legroom. However, the close proximity to the lavatories may be bothersome as passengers tend to congregate here. The tray table is in the armrest, making the armrest immovable and slightly reducing seat width. There is no floor storage for this seat during take-off and landing. 14 J None No Power Seat 14 J is an Economy Class Exit Row seat that has extra legroom. However, the close proximity to the lavatories may be bothersome as passengers tend to congregate here. The tray table is in the armrest, making the armrest immovable and slightly reducing seat width. There is no floor storage for this seat during take-off and landing. 14 K None No Power Seat 14 K is a standard Economy Class seat that has extra legroom. However, the close proximity to the lavatories may be bothersome. Also, the protrusion from the Exit slide may restrict leg space. The tray table is in the armrest, making the armrest immovable and slightly reducing seat width. There is no floor storage for this seat during take-off and landing. 2 A None No Power Seat 2 A is a Club Business Class seat in the last row of the section where noise from the more crowded Economy Class may be bothersome. 2 C None No Power Seat 2 C is a Club Business Class seat in the last row of the section where noise from the more crowded Economy Class may be bothersome. 2 D None No Power Seat 2 D is a Club Business Class seat in the last row of the section where noise from the more crowded Economy Class may be bothersome. 2 G None No Power Seat 2 G is a Club Business Class seat in the last row of the section where noise from the more crowded Economy Class may be bothersome. 2 H None No Power Seat 2 H is a Club Business Class seat in the last row of the section where noise from the more crowded Economy Class may be bothersome. 2 K None No Power Seat 2 K is a Club Business Class seat in the last row of the section where noise from the more crowded Economy Class may be bothersome. 32 A None No Power Seat 32 A is an Economy Class seat whose close proximity to the lavatories may be bothersome. 32 B None No Power Seat 32 B is an Economy Class seat whose close proximity to the lavatories may be bothersome. 32 C None No Power Seat 32 C is an Economy Class seat that may have limited recline. This seat juts out into the aisle and it often bumped by passengers and crew members passing by. The close proximity to the lavatories may be bothersome. 32 H None No Power Seat 32 H is an Economy Class seat that may have limited recline. This seat juts out into the aisle and it often bumped by passengers and crew members passing by. The close proximity to the lavatories may be bothersome. 32 J None No Power Seat 32 J is an Economy Class seat whose close proximity to the lavatories may be bothersome. 32 K None No Power Seat 32 K is an Economy Class seat whose close proximity to the lavatories may be bothersome. 33 D None No Power Seat 33 D is an Economy Class seat that does not recline. The close proximity to the lavatories may be bothersome. 33 F None No Power Seat 33 F is an Economy Class seat that does not recline. The close proximity to the lavatories may be bothersome. 33 G None No Power Seat 33 G is an Economy Class seat that does not recline. The close proximity to the lavatories may be bothersome. 36 A None No Power Seat 36 A is an Economy Class Exit Row seat that has extra legroom. However, the close proximity to the lavatories may be bothersome as passengers tend to congregate here. The tray table is in the armrest, making the armrest immovable and slightly reducing seat width. There is no floor storage for this seat during take-off and landing. 36 B None No Power Seat 36 B is an Economy Class Exit Row seat that has extra legroom. However, the close proximity to the lavatories may be bothersome as passengers tend to congregate here. The tray table is in the armrest, making the armrest immovable and slightly reducing seat width. There is no floor storage for this seat during take-off and landing. 36 C None No Power Seat 36 C is an Economy Class Exit Row seat that has extra legroom. However, the close proximity to the lavatories may be bothersome as passengers tend to congregate here. The tray table is in the armrest, making the armrest immovable and slightly reducing seat width. There is no floor storage for this seat during take-off and landing. 36 D None No Power Seat 36 D is an Economy Class Exit Row seat that has extra legroom. However, the close proximity to the lavatories may be bothersome as passengers tend to congregate here. The tray table is in the armrest, making the armrest immovable and slightly reducing seat width. There is no floor storage for this seat during take-off and landing. 36 F None No Power Seat 36 F is an Economy Class Exit Row seat that has extra legroom. However, the close proximity to the lavatories may be bothersome as passengers tend to congregate here. The tray table is in the armrest, making the armrest immovable and slightly reducing seat width. There is no floor storage for this seat during take-off and landing. 36 G None No Power Seat 36 G is an Economy Class Exit Row seat that has extra legroom. However, the close proximity to the lavatories may be bothersome as passengers tend to congregate here. The tray table is in the armrest, making the armrest immovable and slightly reducing seat width. There is no floor storage for this seat during take-off and landing. 36 H None No Power Seat 36 H is an Economy Class Exit Row seat that has extra legroom. However, the close proximity to the lavatories may be bothersome as passengers tend to congregate here. The tray table is in the armrest, making the armrest immovable and slightly reducing seat width. There is no floor storage for this seat during take-off and landing. 36 J None No Power Seat 36 J is an Economy Class Exit Row seat that has extra legroom. However, the close proximity to the lavatories may be bothersome as passengers tend to congregate here. The tray table is in the armrest, making the armrest immovable and slightly reducing seat width. There is no floor storage for this seat during take-off and landing. 36 K None No Power Seat 36 K is an Economy Class Exit Row seat that has extra legroom. However, the close proximity to the lavatories may be bothersome as passengers tend to congregate here. The tray table is in the armrest, making the armrest immovable and slightly reducing seat width. There is no floor storage for this seat during take-off and landing. 4 A None No Power Seat 4 A is an Economy Class Bulkhead seat that has extra legroom due to the position of the Bulkhead. The tray table is in the armrest, making the armrest immovable and slightly reducing seat width. There is no floor storage for this seat during take-off or landing. 4 B None No Power Seat 4 B is an Economy Class Bulkhead seat that has extra legroom due to the position of the Bulkhead. The tray table is in the armrest, making the armrest immovable and slightly reducing seat width. There is no floor storage for this seat during take-off or landing. 4 C None No Power Seat 4 C is an Economy Class Bulkhead seat that has extra legroom due to the position of the Bulkhead. The tray table is in the armrest, making the armrest immovable and slightly reducing seat width. There is no floor storage for this seat during take-off or landing. 4 H None No Power Seat 4 H is an Economy Class Bulkhead seat that has extra legroom due to the position of the Bulkhead. The tray table is in the armrest, making the armrest immovable and slightly reducing seat width. There is no floor storage for this seat during take-off or landing. 4 J None No Power Seat 4 J is an Economy Class Bulkhead seat that has extra legroom due to the position of the Bulkhead. The tray table is in the armrest, making the armrest immovable and slightly reducing seat width. There is no floor storage for this seat during take-off or landing. 4 K None No Power Seat 4 K is an Economy Class Bulkhead seat that has extra legroom due to the position of the Bulkhead. The tray table is in the armrest, making the armrest immovable and slightly reducing seat width. There is no floor storage for this seat during take-off or landing. 43 C None No Power Seat 43 C is an Economy Class seat that may be bumped into by service carts or others passing by due to the awkward configuration transition from 4 to 3 seats. 43 H None No Power Seat 43 H is an Economy Class seat that may be bumped into by service carts or others passing by due to the awkward configuration transition from 4 to 3 seats. 44 A None No Power Seat 44 A is an Economy Class seat that may have restricted legroom because it is misaligned with the row ahead. This seat may be preferable for those traveling with a companion, as this seat is one of the few coupled Economy Class seats on this plane. 44 B None No Power Seat 44 B is an Economy Class seat that may have restricted legroom because it is misaligned with the row ahead. This seat may be preferable for those traveling with a companion, as this seat is one of the few coupled Economy Class seats on this plane. 44 J None No Power Seat 44 J is an Economy Class seat that may have restricted legroom because it is misaligned with the row ahead. This seat may be preferable for those traveling with a companion, as this seat is one of the few coupled Economy Class seats on this plane. 44 K None No Power Seat 44 K is an Economy Class seat that may have restricted legroom because it is misaligned with the row ahead. This seat may be preferable for those traveling with a companion, as this seat is one of the few coupled Economy Class seats on this plane. 45 A None No Power Seat 45 A is a standard Economy Class seat. This seat may be preferable for those traveling with a companion, as this seat is one of the few coupled Economy Class seats on this plane. 45 B None No Power Seat 45 B is a standard Economy Class seat. This seat may be preferable for those traveling with a companion, as this seat is one of the few coupled Economy Class seats on this plane. 45 J None No Power Seat 45 J is a standard Economy Class seat. This seat may be preferable for those traveling with a companion, as this seat is one of the few coupled Economy Class seats on this plane. 45 K None No Power Seat 45 K is a standard Economy Class seat. This seat may be preferable for those traveling with a companion, as this seat is one of the few coupled Economy Class seats on this plane. 46 A None No Power Seat 46 A is a standard Economy Class seat. This seat may be preferable for those traveling with a companion, as this seat is one of the few coupled Economy Class seats on this plane. 46 B None No Power Seat 46 B is a standard Economy Class seat. This seat may be preferable for those traveling with a companion, as this seat is one of the few coupled Economy Class seats on this plane. 46 J None No Power Seat 46 J is a standard Economy Class seat. This seat may be preferable for those traveling with a companion, as this seat is one of the few coupled Economy Class seats on this plane. 46 K None No Power Seat 46 K is a standard Economy Class seat. This seat may be preferable for those traveling with a companion, as this seat is one of the few coupled Economy Class seats on this plane. 47 A None No Power Seat 47 A is a standard Economy Class seat. This seat may be preferable for those traveling with a companion, as this seat is one of the few coupled Economy Class seats on this plane. 47 B None No Power Seat 47 B is a standard Economy Class seat. This seat may be preferable for those traveling with a companion, as this seat is one of the few coupled Economy Class seats on this plane. 47 J None No Power Seat 47 J is a standard Economy Class seat. This seat may be preferable for those traveling with a companion, as this seat is one of the few coupled Economy Class seats on this plane. 47 K None No Power Seat 47 K is a standard Economy Class seat. This seat may be preferable for those traveling with a companion, as this seat is one of the few coupled Economy Class seats on this plane. 48 A None No Power Seat 48 A is a standard Economy Class seat. This seat may be preferable for those traveling with a companion, as this seat is one of the few coupled Economy Class seats on this plane. 48 B None No Power Seat 48 B is a standard Economy Class seat. This seat may be preferable for those traveling with a companion, as this seat is one of the few coupled Economy Class seats on this plane. 48 J None No Power Seat 48 J is a standard Economy Class seat. This seat may be preferable for those traveling with a companion, as this seat is one of the few coupled Economy Class seats on this plane. 48 K None No Power Seat 48 K is a standard Economy Class seat. This seat may be preferable for those traveling with a companion, as this seat is one of the few coupled Economy Class seats on this plane. 49 A None No Power Seat 49 A is an Economy Class seat in the last row of the plane that does not recline. This seat may be preferable for those traveling with a companion, as this seat is one of the few coupled Economy Class seats on this plane. 49 B None No Power Seat 49 B is an Economy Class seat in the last row of the plane that does not recline. This seat may be preferable for those traveling with a companion, as this seat is one of the few coupled Economy Class seats on this plane. 49 J None No Power Seat 49 J is an Economy Class seat in the last row of the plane that does not recline. This seat may be preferable for those traveling with a companion, as this seat is one of the few coupled Economy Class seats on this plane. 49 K None No Power Seat 49 K is an Economy Class seat in the last row of the plane that does not recline. This seat may be preferable for those traveling with a companion, as this seat is one of the few coupled Economy Class seats on this plane. 5 D None No Power Seat 5 D is an Economy Class Bulkhead seat that has extra legroom due to the position of the Bulkhead. The tray table is in the armrest, making the armrest immovable and slightly reducing seat width. There is no floor storage for this seat during take-off or landing. 5 F None No Power Seat 5 F is an Economy Class Bulkhead seat that has extra legroom due to the position of the Bulkhead. The tray table is in the armrest, making the armrest immovable and slightly reducing seat width. There is no floor storage for this seat during take-off or landing. 5 G None No Power Seat 5 G is an Economy Class Bulkhead seat that has extra legroom due to the position of the Bulkhead. The tray table is in the armrest, making the armrest immovable and slightly reducing seat width. There is no floor storage for this seat during take-off or landing. 50 D None No Power Seat 50 D is an Economy Class seat in the last row of the plane that does not recline. 50 F None No Power Seat 50 F is an Economy Class seat in the last row of the plane that does not recline. 50 G None No Power Seat 50 G is an Economy Class seat in the last row of the plane that does not recline. 7 A None No Power Seat 7 A is an Economy Class seat whose close proximity to the lavatories may be bothersome. 7 B None No Power Seat 7 B is an Economy Class seat whose close proximity to the lavatories may be bothersome. 7 C None No Power Seat 7 C is an Economy Class seat that may have limited recline. This seat juts out into the aisle and it often bumped by passengers and crew members passing by. The close proximity to the lavatories may be bothersome. 7 H None No Power Seat 7 H is an Economy Class seat that may have limited recline. This seat juts out into the aisle and it often bumped by passengers and crew members passing by. The close proximity to the lavatories may be bothersome. 7 J None No Power Seat 7 J is an Economy Class seat whose close proximity to the lavatories may be bothersome. 7 K None No Power Seat 7 K is an Economy Class seat whose close proximity to the lavatories may be bothersome. 8 D None No Power Seat 8 D is an Economy Class seat whose close proximity to the lavatories may be bothersome. 8 F None No Power Seat 8 F is an Economy Class seat whose close proximity to the lavatories may be bothersome. 8 G None No Power Seat 8 G is an Economy Class seat whose close proximity to the lavatories may be bothersome. 9 D None No Power Seat 9 D is an Economy Class seat whose close proximity to the lavatories may be bothersome. 9 F None No Power Seat 9 F is an Economy Class seat whose close proximity to the lavatories may be bothersome. 9 G None No Power Seat 9 G is an Economy Class seat whose close proximity to the lavatories may be bothersome. All seats have individual touch screens that feature a large selection of music. Songs can be selected by album, or from your own personalized playlist. Browsing is available in 13 different languages including English and French. Passengers wishing to take advantage of in-flight entertainment may purchase Air Transat's re-usable headset or bring their own. All seats have individual touch screens that feature a large selection of TV and movies. Club Class features personal seatback TVs with 12" screens, and Economy Class features personal seatback TVs with 9" screens. Browsing is available in 13 languages including English and French. Laptop powerports are available in Club Class. USB ports are available at each seat for charging of tablets, cell phones, and other devices. This A330-200 has 345 seats in a 2-class configuration. There are 12 seats in Club Class and 333 seats in Economy Class. Club is Air Transat's Business Class. This version of the A330-200 is the re-designed version with a remodeled Club Class, brand new Economy Class, featuring personal entertainment systems. Club class has been reduced to 12 seats for maximum comfort and service. There is a protrusion from the exit door that restricts leg room. Plane is ok nothing special. 2by2s are ok. but the leather seats are terrible and very uncomfortable. They really should be replaced. Air Transat food is terrible, especially the sandwiches and stuffed pizza pockets. Eat before your flight. Review is for seats 4A/B/C & 4H/I/J Row 4 is bulkhead seating which you pay more for but so worth the extra charge. 4A is window, B is middle and C is aisle right behind Club Class - there was so much leg room is was actually hard to grab your stow away luggage under the Club seat in front of you. 4 H/I/J are also window/middle & aisle same leg room which is ample. Table trays and individual TV's are stowed in the arm rest which pull up easily. Seats are well worth the extra charge and have more leg room than club class. Seat pitch is ok - for a 7 1/2 hour flight from Punta Cana - Edmonton was very comfy even in the middle seat. Bulkhead seats which are in the middle and believe they are D/E & F do not have as much leg room. Great seats! Flight TS 794 from Edmonton to Cancun via Calgary. Aircraft registration was C-GUBH. This was my first experience flying Air Transat and it was a poor experience overall. The location of this seat was good. It was close enough to the lavatories but not close enough to be bothersome. The seats were a hard leather and felt narrow based on the contouring. The buy on board food was mediocre. The in-flight entertainment system was very good and extremely responsive to the touch. An important note. Row 17 has missing windows on both sides of the aircraft. I am not sure why the seat plan is not updated to show this. You can even see this during the seat selection process that seats 17A and 17K are blocked out so someone booking seats doesn't get surprised by this. 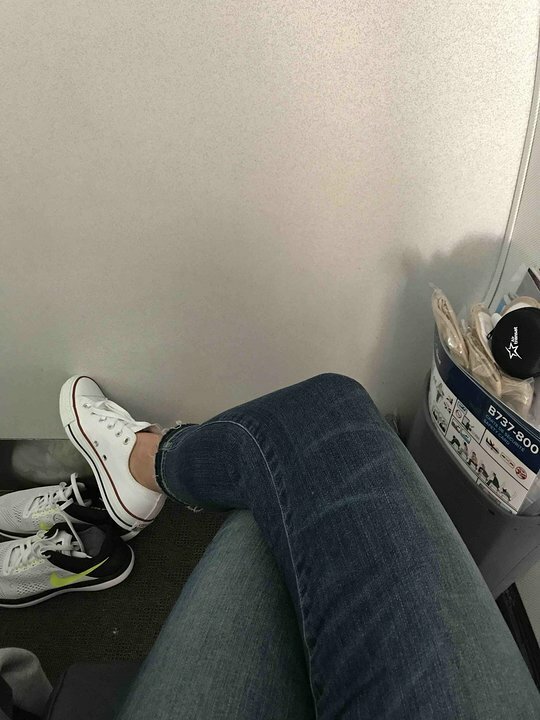 Ther is a bulkhead just in front of you (between economy class and club class) wich offer less space for your leg than in other row (where you can put your legs under the seat which is in front of you). I thank row 5 seats G, F and D must be in green and yellow. I was flying from Düsseldorf, Germany Punta Cana, Dominican Republic and the seat was terrible. The aisles are so narrow that I was constantly kicked against my shoulder by any passenger or crew passing by - no sleeping possible for me. My wife sat on 29F in the middle and it seemed better because of the fact that she was not kicked permanently and could actually sleep a bit. The service of the flight was ok, not too bad, food was below average. 1A and 1C are excellent seats in Air Transat's Club Class. There is ample leg room, the seats are wide and comfortable, the head rests are fully adjustable, and there's no one in front to recline into you.The food offered on the BCN/YUL route is by chef Daniel Vezina and is actually quite tasty. Upon arrival on the aircraft you are greeted with a glass of sparkling wine (although this may depend on the time your flight departs) and a hot damp towel to cleanse your hands. Service from the flight attendants throughout the flight is very attentive and professional. The twelve passengers of Club Class share one bathroom at the front of the plane. Despite the illustration which makes it appear that the bathroom is very close to the first row, it is actually far enough away that it's not bothersome at all. I would definitely fly AT's Club Class again in the future! Row 1 is against the bulkhead and has no footrest. Row 2 , the second row of club class, does have a footrest. Actual seat size and leg room were fine. Service was attentive and friendly with regular water runs and more food that I was expecting. Note row 17 does not have a window at all: blank wall. Rows 16 and 18 have views through 2 windows. I chose this seat as I prefer to have an aisle seat. The seat itself was as you would expect with the dimensions, etc. provided. 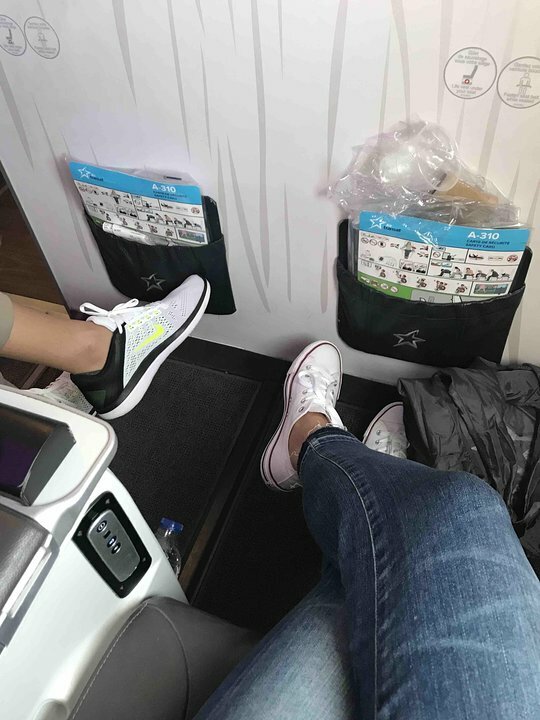 Comfort level was as expected and the environment within the plane was bright and fresh (see some of the photos from other travellers). The service was good, friendly and attentive cabin crew. The food was better than I was expecting for economy. The chicken dish which I selected was actually very nice! I think there was a choice of three dishes, chicken, beef and noodles. Usual level of refreshments offered. The only gripe I have about the seat is that the leg of the seat row in front is in the middle of the space for your feet. Not an issue as you can put one foot either side, but you won't get a bag under there. In general, pleasant flight (I flew during the day so can't comment on comfort level for sleeping), would fly with Air Transat again. This plane was extremely uncomfortable. The seats were narrow and there was barely enough legroom for my 5'5"/165cm self. The screens were too close to my face, which made the entertainment unenjoyable. 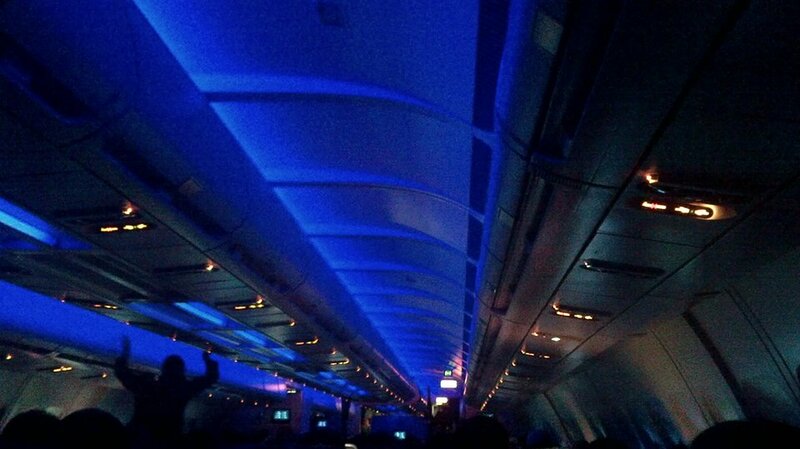 The ambient colour-changing lighting also piqued a headache. I could really feel the motions of the plane and so could my normally not-motion-sensitive travel companion. I was sick on this flight (YYZ-CDG) 4 times, which has not happened in years. Our return flight was on an A310, which made a world of difference. The seats were much, much more comfortable - to the point that I didn't even care that there were no individual screens. I paid extra for legroom - seat 14A. Horrible seat - wall in front - very little legroom, wall made it very claustrophobic! Worst flight, bad seat. Would not choose this again! Not worth the extra fee. We sat in seats 46D and 46F. The seats are narrow and my bottom hurt after 6 hours of flying. I am 6'2" and my knees were about an inch from the seat in front. Thankfully, you can stretch into the aisle from 46D as it is a bit wider. Quiet area, but we had flight attendants in the rear cabin/kitchen who were laughing and talking during the sleep period. Food and service was great. Aisles are about 18" wide or so it appears, very narrow. 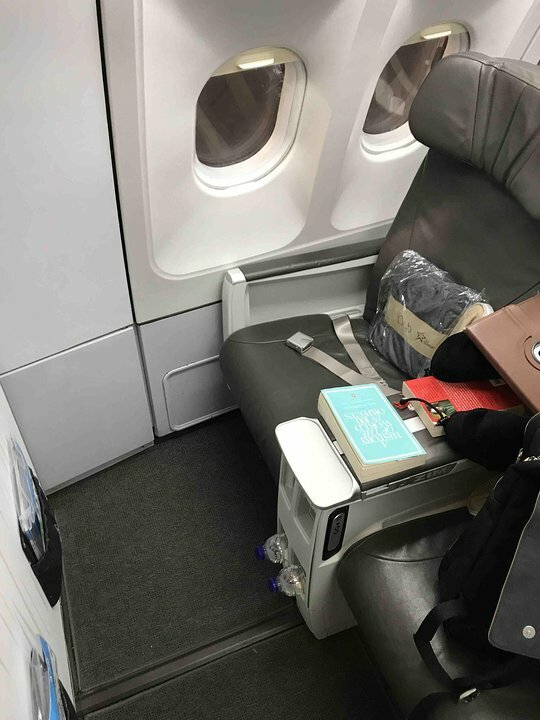 We paid for the extra legroom seats for a 9.5 hour flight from Manchester to Vancouver. The seat itself was adequate and the extra legroom was good but the seat seemed narrower than other airlines I have travelled with. The big disappointment was the menu as Transat have replaced their standard menu with a new Bistro menu and you get a hot or cold sandwich which, for a long haul flight I was not happy with. Don't think I will use Transat again and will look at Air Canada or BA. While the legroom in 4K is ample and much-appreciated, the seat itself was the narrowest airplane seat ive ever sat in. My flight was between Calgary, Alberta and Punta Cana and was 7+ hours. The seat was uncomfortably narrow. Later in my trip I flew on a Bombardier Q-400 and my seat was far wider and more comfortable than on this plane. Seeing as this info is not on the web I took a tape measure and the actual space between the edge of the seat and the seat back in front is 11 inches. Not bad at all, plenty of room for a cheap ticket, but agree that the seats are quite narrow for long haul. Had non lactose meal, which is also listed as gluten free, probably done to save money, but works. Was chicken on rice with some veg, a salad and fruit salad both ways, perfectly edible. Late snack on way out was a salad sandwich as I couldn't have the pizza which smelled lovely. Snack on the way back was banana bread and was surprisingly nice and most welcome. Only two drinks runs per flight; they expect you to be asleep on this one, but just pop down the back and the attendants were happy to supply more drinks if you wanted them. All in all a good flight and great value for money, in flight entertainment was very good. The Club Class was better than expected. Lots of leg room for the bulkhead seats however, the passengers in the second row seemed to have issues getting in an out of their seats, so go for bulkhead. Once in though, the leg room seemed decent. The padding on the seats could be thicker but for a 3 hour flight it was fine. In flight entertainment was good although the person next to me had issues with their screen so they weren't able to take advantage of the movies etc. You get an amenity kit which includes things like headphones, eye mask, blanket and neck pillow. 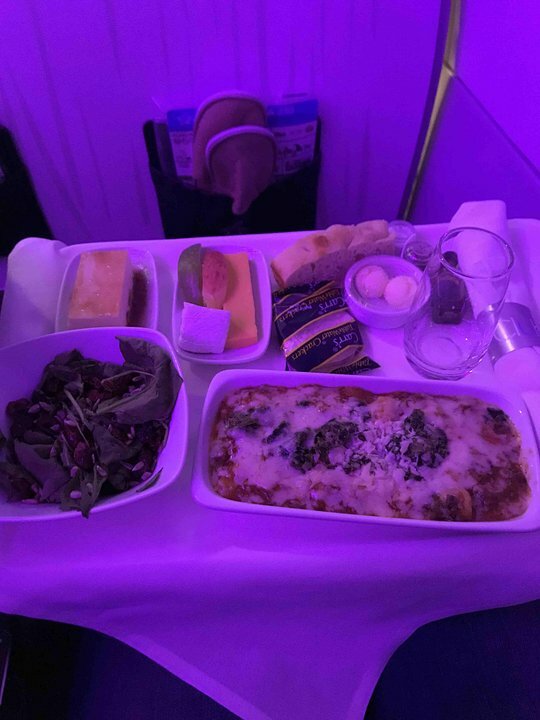 The meal on both flights were great. Service was excellent. Overall, I enjoyed this better than flying American/Delta first class when flying domestic. Worth the upgrade if you can. The current design has replaced overhead individual fan vents with just a light. Air conditioning struggles with the larger number of seats. Both trips out/back, comfort is very much position dependent in economy: near the toilets and exits was cool and pleasant, much further back or at front of economy was much hotter, like being in an office at 28deg.C or so on one of the flights until I complained (nothing done about it until then), was still sub-optimal on return flight but not too unpleasant. London Gatwick to Calgary economy class. Seats 44H & 44K. Excellent legroom in front - seemingly more than others in economy - and the extra space at the side of 44H was handy for standing up without getting in the way of other passengers or crew. Well worth the extra charge. Economy Manchester to Toronto. Seats have good legroom, clear interactive screens, enough seat width and with the aircraft having two fewer seats per row this far back, the aisle is wider at this seat and at least 2 rows ahead, making it easier to move around. Food was good and new lighting effective. Fewer people come to this section of the aircraft because toilets are forward of row 36, which makes for a quieter experience. Cabin Crew use back of the airplane to prepare the trollies. USB charging socket at every seat. Adrian from Birmingham U.K. Paid $75 for this exit seat and it was not worth it. Got kicked/ knocked by crew as they went by with carts; the new configuration of this plane gives narrow aisles which is hard for the crew to maneuver through. Was woken up several times during night as it is beside the washrooms. Air Transat flies 1 versions of Airbus A330-200.